Be the first to share your favorite memory, photo or story of Jonathan. This memorial page is dedicated for family, friends and future generations to celebrate the life of their loved one. 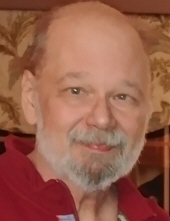 Jonathan S. "Jon" Render, age 60, a resident of Aurora, IL since 1995, formerly of Caseyville, Naperville and Charleston, IL, passed away on Tuesday, March 26, 2019 at Advocate Lutheran Hospital in Park Ridge, IL after battling diabetes. He was born May 7, 1958 in East St. Louis, IL. Beloved husband of Erin Render (nee Rardin), whom he married October 18, 1980, loving father of Corey and Amanda (fiancé, John Bouma) Render, adored Grampy of Andy, devoted son of the late James and Wilberta (nee Schwehr) Render, dear brother of Monica (the late Dennis) O'Rourke-Vaccaro of Ballwin, MO, James (Shirley) Render of Fairview Heights, IL, Melissa (Robert) Jones of Naperville and Timothy (Georgia) Render of Naperville, IL, son-in-law of Jack and Rosemary Rardin of Charleston, IL, dear brother-in-law of Byron Rardin of Tolono, IL Jay Rardin of Charleston and Jerrine Lang of Palm City, FL, fond cousin, uncle, great-uncle and friend to many. Jon grew up in Caseyville, IL, moved to Naperville in 1973 and was a 1976 graduate of Naperville Central High School. He attended Eastern Illinois University in Charleston, where he was a member and officer of Delta Chi fraternity and where he met his future wife, Erin. Jon lived in Charleston until 1995 when he subsequently moved to Aurora. Jon worked as a facilities manager for many years at CCAR in Charleston, Stone Care Services in Chicago and Naperville Public Libraries. Jon loved military history and enjoyed collecting military and sports memorabilia. He was an avid car buff and frequently visited the Volo Auto Museum, Volo, IL and The Auburn Cord Duesenberg Automobile Museum in Auburn, IN. A Memorial Visitation will be held Saturday, March 30, 2019, 1:00-5:00 PM at Friedrich-Jones Funeral Home & Cremation Services, 44 S. Mill St., Naperville, IL. Per his wishes, Jon's body was donated for scientific study. In lieu of flowers, donations in Jon's memory may be made to a charity of the donor's choice. To send flowers or a remembrance gift to the family of Jonathan S. "Jon" Render, please visit our Tribute Store. "Email Address" would like to share the life celebration of Jonathan S. "Jon" Render. Click on the "link" to go to share a favorite memory or leave a condolence message for the family.